Zenit: Will the REAL Leicaflex please stand up? The original Zenit was based so closely on the Leica design that the baseplates were interchangeable... it even used the Leica 39mm screw lens mount! One of the most fondly held dreams of Leica users, after the appearance of the Contax S in 1949 made the SLR more than a curiosity, was a 35mm SLR with the size, weight, simplicity and handling characteristics of the classic screw mount Leica rangefinder cameras. This was a dilemma with which Leica's own designers wrestled for years before finally coming out in 1964 with the Leicaflex, a camera that bore the same relationship to the classic Leica that a Mercedes diesel bus bears to the 300SL Gullwing: it came from the same stable, but it wasn't the same animal. All across Europe, it had been the same story. The Contax itself handled pretty well but its workmanship and reliability had been unconvincing and it was terribly complex; the Exakta handled little better with a pentaprism than it had without, and Zeiss (West)offered a choice between a neat little leaf-shuttered toy and a huge, magnificently crafted monstrosity that set a standard for ungainliness which went unchallenged until the Leicaflex itself. All the world appeared to have given up on the idea of a small, light, simple, Leicalike SLR. Ah, had they only known. A thousand miles behind the Iron Curtain on the outskirts of Moscow, the very camera that the Leicaphiles were dreaming of had been in production since 1953 (indeed, after the Contax, Rectaflex and Exakta, I think it was the 4th camera to have a pentaprism viewfinder). The original Zenit was made in the same plant that produced the Zorki, a fairly decent Leica II copy that had itself descended from the FED of the mid-1930s. In transforming the Zorki into an SLR, the simplest possible approach was taken: The rangefinder housing was removed from the top and replaced by a groundglass screen and prism; a mirror was added below, with a rope-and-pulley setting system borrowed from the Contax S; and the 39mm lens mount was pushed forward to make room for the mirror inside. To trip the mirror, a very simple L-shaped lever was installed at the bottom so that when the shutter release spring was pushed down it released the mirror just before the shutter fired. All details that didn't have to be changed remained as they had been in the Zorki (and the Leica), including the removable takeup spool, bottom-loading removable baseplate (interchangeable with prewar Leicas), and the entire shutter and transport mechanism (based on the Leica II, the FED, Zorki and Zenit all lacked the slow speed system of the later Leicas). 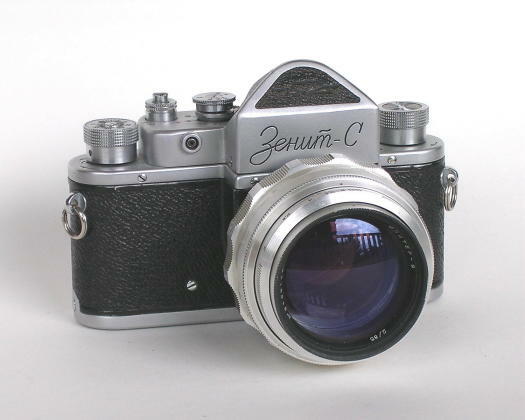 In 1955 the Zenit was improved further by the addition of a variable delay flash synch device, virtually identical to that on the Leica IIIf, the result being named the Zenit C (S in English). In this form the Zenit was probably at its peak of elegance, as I think the IIIf was among Leicas, offering the maximum of modern features within the original design envelope. It is truly a shame that the folks at Leica never took this approach, and an additional pity that the societies of the East and West were so isolated by their mutual animosity that this remarkable camera was hidden from us all these years. The elegant Zenit S with its remarkable 85/2.0 Jupiter-9 lens, with an OM1 for scale.